We met with Korean Jay Jeon (Jeon Yang-jun) for a short talk during Ljubljana International Film festival (LIFFe) in November last year. He was one of the three international jury members, who a day after our meeting awarded Danish director Annet K. Olsen with the main Kingfisher Award. But Jay Jeon is more known as one of the founders and one of the four main programme directors of the Busan International Film Festival (PIFF). 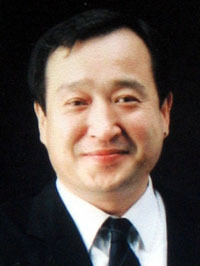 Some may also recognize him as a producer of the two masterpieces of Korean cinema – Peppermint Candy and Oasis, both directed by Lee Chang-dong. Is there any similarity between LIFFe and PIFF? I don't think it is possible to compare both festivals. The size is very different and Busan is focused on Asian films, while Ljubljana is focusing more on Balkan films. How have you got involved with LIFFe? I know Jelka Stergel [programme director of the festival] for several years. During the Cannes festival last year, she asked me to be in the jury for LIFFe. I have also met some other Slovenian producers and filmmakers on festivals around the world. As one of the programmers I have presented several Slovenian films on PIFF. Since 1999 I have presented exactly one of your films every year. Films of Jan Cvitkoviè or Damjan Kozole were accepted quite well by the Korean audience. How many tickets were sold in Busan this year? ...while in Ljubljana there were some 50.000 tickets sold until this day. Now, imagine the population of Busan and that of Ljubljana and compare the difference in tickets sale on both festivals. (Laughs.) You are right. City of Busan is much bigger then Ljubljana. LIFFe is the best not only in the region but also in the world, considering its really tiny budget. Tiny budget is obviously reflected in a limited selection of films. Most of Asian films, which are shown on LIFFe this year, had been already presented earlier on other festivals. Maybe Ljubljana could take an opportunity and present some Asian films that are not yet known in Europe. But to select very new and good films would cost much more money. Yet The Host was shown in Ljubljana less then four months after its release in Seoul. Korean film industry is becoming more interested in European market. For them, the European market was very small during the past ten years. I think in the next years it will eventually grow. But at the moment Korean film industry still depends mainly on Japanese market, which represents more than 80% [of their foreign sale]. How did you meet director Lee Chang-dong? In 1998 I was attending the Thessaloniki Film Festival with director Lee Kwang-mo. His film Spring in my Hometown was just screened on Directors' Fortnight section of the Cannes Film Festival some weeks earlier. He introduced me to Myung Gae-nam [also acting in Spring in my Hometown], who at that time founded a film company called East Films and decided to produce some considerable art films with Lee Chang-dong... So Gae-nam asked me to work with him and we worked together for several years. What did you think after you had read the script for Peppermint Candy? I realized it would be a masterpiece. Except the opening sequence, which I thought it was too long. Do you remember the "picnic" sequence? Lee Chang-dong wanted to underline many aspects of the plot in the opening sequence, which at the end had become little longer. Later I tried to include the film into competition at Cannes, but the selection committee didn't like the opening sequence. And consequently they screened Peppermint Candy in the Director Spotlight selection instead. Moon So-ri was rather unknown at that time. I didn't know her before. Lee Chang-dong has chosen her. (Laughs.) Myung Gae-nam just wanted to make an excellent film and we were free from any financial pressures. But her role was actually quite small. Has your opinion about her changed after Peppermint Candy was finished? To be honest, I was a little dubious about her acting ability after Peppermint Candy. She was acting too shy. We were still not sure about her... But Lee Chang-dong knew her. Later in Oasis she was marvellous. Everybody was quite shocked with her performance. Sol Kyung-gu and Moon So-ri, the two main actors, became our national hero and heroine. Next to PIFF there are many other film festivals in Korea. Some are very small and very specialised. How do you see their future? In Japan for instance many festivals have closed. Which is very sad. In general Asian film festivals are not doing well due to financial and also political difficulties. Most of festivals in Asia are suffering from censorship. In contrast to other Asia countries, Korean film festivals are prospering at the moment. But it is quite difficult to talk about their future. I think festivals should get financial help from the central government and local city council... Actually many smaller Korean festivals are facing difficulties attracting Korean films. Except for Busan of course. Because every producer wants to go to Busan. What do you think about reduction of the screen quota? Korean government seems to believe that the local film industry is strong enough to survive on a free market. I don't think so. The government has reduced the screen quota to half on the 1st of July . Korean films will survive, but the new system of screen quota will affect them in a year or two. The situation will be tougher. Director Bong Joon-ho has proposed recently something like "small screen quota", which should encourage distributors to present commercially less appealing art films. Well, in principle his idea looks possible. But in reality, if there is no audience, how can you force distributors to screen those films? And how to tell people which films to watch? That's my question. When I was young, French films or Italian and Hollywood films were quite popular in Korea. Korean films were on contrary of very poor quality. Nobody wanted to watch them. Now the situation is the opposite. Korean film market is quite big and some hundred films are produced annually. Worldwide it ranks 5th at the moment and Korean audience watch Korean films because they are very strong and entertaining. And they are very diverse... from The Host to Oasis.